The holder of the Instant Gift Voucher is deemed to be the beneficiary. Only valid Instant Gift Voucher at the sole discretion of BATA shall be accepted for redemption. Maximum of "three" Instant Gift Vouchers can be used against one bill. 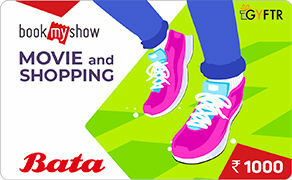 BATA or its affiliates are not responsible on account of the beneficiary sharing the Instant Gift Voucher number and the Voucher getting redeemed on that account. Instant Gift Vouchers will be accepted across all outlets mentioned, but BATA at its sole discretion may add or remove an outlet from the list without giving any prior notice. BATA makes full efforts to accept all Instant Gift Vouchers but on account of technical / administrative reasons, an outlet may refuse to accept vouchers. This Instant Gift Voucher cannot be redeemed on specific block out dates, BATA may add or delete any date on its sole discretion. BATA or any of its partners would not be liable for any form of compensation etc on account of an outlet not being able to accept Instant Gift Voucher. The customer would be liable to settle the bill.